Some of you know Nick, a very unasuming 18 year old . As Nick said on Friday Pete aboard Azerack had lots of tailing marlin not interested in feeding. 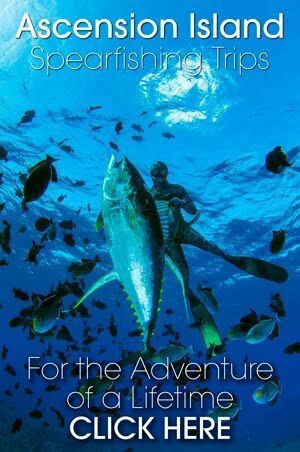 So we decided to move after broadbill drift, one broken rod and some gemfish aboard Assassin. The water was was flat as it gets so sighting a tailer was not hard. The first must have see our lures as it accelerated up to them as we past, not to be seen again. Right lets get right into them . The boys set up the floats and lines . Just as they were getting organised out look out Michelle spotted a fish . I turned Assassin around .to follow it. Nick was on the side of the cockpit in boardies, fins and the speargun at the ready. As we came to a stop I gave Nick the go ahead so he dove in the water and swam hard to the fish. The Marlin must have heard the splash and circled around behind him. Nick stopped and looked around and the marlin came in all lit up, then turned away. Nick swam hard and fired , not sure if he had hit home or not. Then his float line started whistling past . As he hit the surface he sait "yip I got it." The floats shot past at incredible speed , this took about 20 seconds!!! Then the big swim after float with the second gun that our son Mark, Nicks friend as support. Nick had told us that striped marlin stay on the surface and aren't aggresive. This fish didn't stay on the surface, as Nick worked his way down his float line with his second gun, the marlin turned on him. This is disconserting . After he finally got the second spear on a 20 metre float into the marlin , the fish took both floats and Nick down several times. Nick worked his way down with the 3rd gun that Mark had got for him having trouble with the fish coming at them. At one stage Mark though the marlin was going to eat him as it was charging at him within a metre!!! . Mark was gutted that his underwater camera he got for his 21st last October had died and was sent back to the repairers. After and hour and a half the fish was slowing down but still spnt most of the time circling the boys. When Nick got the 4th spear into it, it really slowed down so Nick manouvered it to the boat and with it's head out of the water a sucker fish leapt off, this must have been when the marlin passed away. We got hold of the bill and pulled it through the door and onto the boat. This was a difficult excerise what with Nicks legs and arms like jelly, and four spears at all different angles we got it aboard. There have been a number of reports of some large sharkes on our coast recently not unuseual for summer. There have even been sightings of Great White Sharks!! Now thats a little disterbing! But for the most part its been Zambezi and other smaller Greys and Milkys. Quiet a few spearfisherman have been harrased and lost their fish to sharks, and one skiboater said that they had to move from a FAD last week as a super large Great whaite was chomping everything. Interesting that there have been 2 articles in the news on Zambezi's this week already. One a World Record Zambezi was caught in the Breede river, and the other a fatal attack on a life guard in the Kei. A ZAMBEZI shark was responsible for attacking and killing a Port St Johns lifeguard at the weekend, Natal Sharks Board head researcher Geremy Cliff said yesterday. He said warm waters along the Eastern Cape coast in summer attracted the sharks. Seasoned lifeguard Sikhanyiso Bangilizwe, 27, was attacked by the shark on Saturday afternoon while swimming with a friend at Second Beach. He was bitten on the shoulder, right arm, back and buttocks. Cliff said an examination of Bangilizwe‘s body had established that a Zambezi (bull) shark had attacked him. I write to give you the details of our research expedition to the Breede River during the week January 19-25. The purpose of the expedition was to determine whether reports of Zambezi (bull) sharks in the Breede River could be confirmed. Scientifically, confirmed reports would be extremely relevant on a global scale as this would represent the most south-westerly distribution of bull sharks in Africa. Joining us on the expedition was Dr. Steve Lamberth and his team from MCM, Hennie Papenfuss from Big Fish Safari and a team of four from SASC. We fished for 3 days with no luck & were rewarded on the 4th day when Hennie caught a bull shark on his line. After an hour and a half struggle with the fish (during which it towed him 2.5km further upstream), Hennie managed to tire her enough to bring her close to shore for landing. Our team then brought her carefully to the shore, where we were able to collect all the required data. We measured her, tagged her with two acoustic continuous tags and one spaghetti tag, and gathered genetic samples in order to determine whether bull sharks in the Breede River represent a distinct population from those found elsewhere in South Africa. She is a world-record breaking shark measuring 4 metres total length, weighing in the vicinity of 550-600kg. This is the largest bull shark known to science - the previous maximum size was thought to be 3.5 metres TL. We also suspect she was heavily pregnant and may very well be using the Breede as a pupping ground. Scientifically speaking, this discovery is huge and groundbreaking. Following the tagging, we proceeded to track her for 43 continuous hours. She spent the majority of the time in the estuary, with only a few hours in the surf zone just outside the river mouth. Here is the news letter published by iSimangaliso the gaurdians over the St Lucia Wetlands Park. It seems that even though the wrecks are outside the MPA they still have say what goes down. Its a damn disaster if you ask me. South Africa's newest dive attractions - two artificial reefs - have been established near Cape Vidal in the iSimangaliso Wetland Park. This places South Africa's first World Heritage Site in the company of Australia's Woongarra Marine National Park which boasts the Cochrane Artificial Reef. Says Andrew Zaloumis Park CEO, "The iSimangaliso Authority seized the opportunity to turn what was a disaster into a tourism and marine research possibility for South Africa's first World Heritage Site.The two rugby-field-size dumb barges, named DAR1 and DAR2, scuttled late last year just south of Cape Vidal are already attracting plentiful marine life in their new role as artificial reefs." The barges were wrecked on the beach 7km north of Cape Vidal - one of the most popular holiday hotspots in the iSimangaliso Wetland Park - on October 21 after their tow lines snapped. The Park was facing a disaster. The barges were marooned on a rocky beach in the Tewate wilderness, not accessible by road, and within the Marine Protected Area (MPA). Apart from environmental damage, like risk to turtle nesting sites and possible damage to King Oscar Reef, they threatened the Park's rarest World Heritage values, it's 'sense of place'. The beached barges were declared 'constructive total losses' by the owners. The owner's insurance cover was only sufficient to cover salvage costs if their removal by refloating and towing was completed quickly and efficiently. The available insurance would certainly not have covered an expensive and environmentally damaging wreck removal should they have broken up on the beach from the buffeting tides and wave action. The Abu Dhabi-based owners and their Canadian agents showed signs of abrogating their responsibilities as it became imperative and urgent to remove the barges out of the MPA. First there was consultation with Ezemvelo, iSimangaliso’s conservation managers, and other parties. The owner's agents then confirmed appointment of a salvage team with SAMSA, the SA Maritime Safety Authority. Independent environmental assessments were undertaken resulting in a technical report involving 13 specialists. These included an assessment of requirements for scuttling vessels and best practice review for establishment of artificial reefs according to the recent July 2008 London Convention and Protocol/UNEP guidelines to which SA is a signatory. SAMSA then directed a salvage company to remove DAR 1 and DAR 2 and scuttle them at approved sites under the Wrecks and Salvage Act. The Department of Environmental Affairs and Tourism (DEAT) authorised removal and scuttling of DAR 2 at the approved site on November 5 and for DAR 1 on November 21. The bathometric sea floor survey identified a site about 2kms south of Cape Vidal and less than 2kms out to sea. This is outside the MPA, in an area zoned for open use. There are no natural reefs within 500m. Before scuttling the barges, strict environmental conditions and pollution prevention measures were set. Pollutants were removed and objects like hatch doors were taken out to minimise flotsam. Everything was done with written approval from DEAT, SAMSA and the iSimangaliso Authority, applying national legislation including the World Heritage Convention Act - and international conventions. Monitoring and strict control of this artificial reef site will be done from Cape Vidal. DAR 1, which is 15m high, lies at 24m, ideal for first-level divers, while DAR 2 is at 36m. The Park's 220km coastline has hard coral reefs from Kosi Bay to Leven Point, 16kms north of Cape Vidal. In the south are rocky shores and flat rocky reefs. As diving is one of the fastest growing sports, a need has arisen for alternative sites to Sodwana Bay and other sensitive dive areas in the northern section of the MPA. The potential disaster of the barges has been turned into a unique opportunity, not only for dive tourism but for environmental, educational and research benefits. " Cape Vidal is the Park's flagship tourism destination but until now has had no dive opportunities, with seasonal dips in visitors. 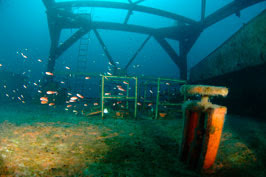 There have been repeated requests from tourism product owners and visitors for a dive experience accessible from there. Except for good all-year visibility and ease of access, these reefs will be similar to those created by the Produce and Nebo wrecks near Aliwal Shoal off Umkomaas, and the T-barge sunk by ORI (Oceanographic Research Institute) off Umhlanga. As the wrecks fall within iSimangaliso, legal mechanisms including a Park Area Notice are in place to ensure compliance. Fishing or spear-fishing are not allowed on or in the vicinity of the wrecks. The reefs are within sight of a controlled launch site and full-time Park compliance staff. A research and monitoring programme has also been tendered. Head of research at the Natal Sharks Board, Geremy Cliff said the new reefs should have a beneficial role in reducing diver pressure on the Sodwana reefs: "But artificial reefs are known to be fish-attracting devices so they will need to be very closely monitored to ensure anglers and spear fishermen don't target them". Kerry Sink, manager of the marine programme for the SA National Biodiversity Institute, shares this concern, "however if these relieve pressure on the natural reefs at Sodwana and diversify the dive experience at Vidal, then they have a role", she said. Advanced diver and underwater photographer Dennis King was one of the first to dive DAR 2: "After just three weeks the whole deck is covered with algae and I counted at least 17 species of fish and shoals of goldies," he said. "With the barges 600m apart and close to Vidal this is going to be an exciting new place for divers of all qualifications." With a hint of some fish around some of the guys have been itching to go spearfishing, others are still sceptical whether the fish are on here yet and have opted for a weekend up at Vidal. I think that the spearfishing will be good this weekend, conditions dependant of course! The water looks like it is clearing ...it is still green on the inside but that could change with the next tide. The problem might be the swell, last weekend I miss called it and a mate left his kit at home and so missed out on the dive. The forecasts are saying that the swell will over 2m and with an 11sec period. If that hits the shore line we will be surfing, and not diving!! But there is aways a chance it is manageable! Let me know if you get in. Cape Vidal Barges Off Limits to Spearfishing!! Shocking News for Spearfisherman!! Although it does not come as a surprise the Barges sunk at Vidal look like they are going to be made exclusive to bubble blowers! In yesterdays Zululand Observer article "Disaster turned to success" the bad news was spilt. diversify the dive experience at Vidal, then they have a role,’ she said. Unfortunately I think there is going to be little anyone can do to help as they are in the Wet lands Park. Spearfishing - Summer Cuta On Their Way? After missing out on the mornings spearfishing, I committed to an arvo dive with a mate. The forecast said the wind was going to pick up, but I figured the vis would be ok and would jump in any way. The reports from the guys who had dived said it was very quiet, and when we got down the South East Devil /Poison wind was blowing. We jumped in any way as this could be our last dive for a couple days with forecast showing east winds and many of the rivers flowing. Any way a little while later another cuta came in while I was on the bottom (the water was not good enough to see them from the top ..unless they swam right underneath you of course) and I got a great shot from below. I first though the shot was too low, as I tend to aim low when shooting up .... lost too many fish shooting up and just getting fine flesh shots in the back. The shot was good and I landed the fish, not before it almost ran all the line off my reel!! Morne also bagged a fish before it got dark. The fish were super fat and healthy. Mine were females with eggs. The small on was 8.5kg gutted and the larger one was 11.9kg gutted. Morne's was also good at 8.7kg gutted. We bumped into some other mates that had dived another reef and they got nothing :-( I guess we were spearfishing in the right place at the right time. Lets hope the cuta start coming out in greater numbers ... and a little help from the weather will also help. The sea looked good for a dive this morning, but the wind and rain kept the boys in bed. I was just thinking to myself that if I did not live so close to the sea, I would be all over the dive this morning! I guess you get a little jaded living where we live ..... but come next week after not diving or surfing for a couple days and the boys will be chomping at the bit to get in again. 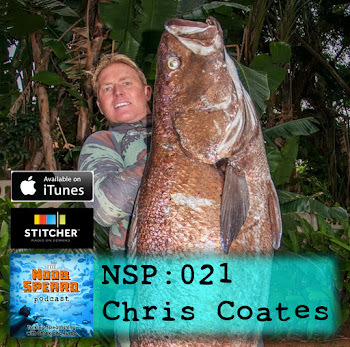 The guys have been getting some fish out on the deeper reefs, I saw some pics of Corrie and another chap with 2 really big cuta shot off Protea Banks earlier this month. Gyula has also been spending some time out on the shoal as always and has got some interesting fish, including a Poensie / Black Muscle Cracker. Where did the swell go? Friday late arvo had some great waves, and the forecast was looking even better and bigger. A mate from PMB even called and asked if it was worth bringing the dive kit down and I told him not to worry. So as fate had it I got an sms the next morning saying "should have brought the the dive kit" The swell had disappeared. Sunday was blown out but the swell started to look like it was picking up. But it never really got big. It kinda fell into place when chatting to my mate in J-Bay .. he said that it was only about 6ft there. Anyway the wind dropped off and we got some great waves before sundown on Sunday and this morning had some great little barrels. The forecast still looks good for the next few days so keep a look out. On the fishing front I was chatting to a fisherman and he said that 30 -40km out to sea the current is screaming south north and that they have got very few cuta. The Geelbeck are still thick out deep and there are loads of Dorado on the FADs. The guys up at Zinkwazi side have been catching the odd cuta in over 30m but thats about all thats been happening. Dinner is going to be good! Next thing the north current pushed in a nasty thermocline and the vis went from 15m on the bottom to 1m. The surface was still clean and a Dorado came and committed 'Hurry Curry' and will now be dinner. We did not hang around as the vis was getting even worse and we had not seen a fish in 40min, and by the time I got to backline some serious waves were breaking on the reef. Complements or Complaints ....of the season! Getting back to work was worse than going back to boarding school!! I am back ... I know I should have blogged earlier, its just that I have been wallowing in self pitty as our Mozambique trip turned out to be a Lemon of note! When we got to the place we were straying the local 'Maritimo' informed us that they are no longer allowing any type of diving in the area. As the turtles can see you and that chases the turtles away! But you can fish if you want ??? So that was our spearfishing holiday down the tube .... 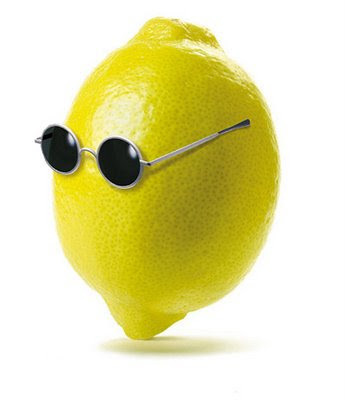 The one holiday we have a year and it was a Lemon!! Anyway the conditions at home have been verygood, but there have not been too many fish around! The odd snoek has been shot on the backline areas and thats about all. The weekend looks to be ok ... hold thumbs! !